One thing you can say for sure about Bangkok — life there is never, ever dull. It’s not been too long since travel writer Poke Rafferty saw off a very frightening threat to his ever-growing family. However, no sooner does he refocus on his wife’s pregnancy (and adopted daughter Miaow’s teenage trials and tribulations) than another weird and potentially dangerous situation drops itself into his lap. The problem is with one of his daughters’ friends — his dad’s gone missing, for longer than usual this time. Sandman Slim never has a lot of good days, anymore, but being dead and back in Hell really takes the cake. He’s been here before, of course — cast into the pit by a friend turned enemy, and then returned of his own free will (sort of) to reign as Lucifer, for a short season. But then he had the saving grace of being alive, which meant all he had to do was escape. In an out of the way Army hospital, there is a broken man. He lies in his bed, unable to move due to the horrible extent of his injuries. Every bone in his body has been broken, yet somehow he lives. And he has a surreal and harrowing story to tell, provided he can make himself remember. It’s 1947, and, after a long and harrowing war, former ABWEHR officer Gregor Reinhardt has returned to the life he knows best — being a police Inspector in Berlin, now a wrecked echo of its former self, and slowly rebuilding. For Reinhardt, it’s a bittersweet return. He is not liked by his new colleagues, who resent both his American patronage and inability to stop asking inconvenient questions. He can count on old friends, but is unsure of his superiors, and the motives of those higher above them. There’s also the reminder of the tragedies that happened here, before he left for the war — the things that left him drunk and suicidal in Yugoslavia. Back then, it took a personal connection to a mysterious and brutal case to bring him back to life. Now, as he walks through the ruins, perhaps he sees in them a reflection of his old self: sad and broken, but not without hope. All the same, such mysteries still awaken something within him, and have a knack of finding their way into his hands. Junior Bender really does not like Christmas. Give him a while and he might tell you why, but it’s a really long and sad story. Which makes it rather ironic that his latest “job” — read “being forced to help an LA crook by another LA crook, because he’s too smart for his own good” — is taking place during the lead-up to that holiday. Junior Bender is one smart thief — maybe a little too smart for his own good. It’s not that he over analyzes situations, or over-thinks his plans. It’s just that other LA crooks recognize how his mind works, and try to get him to do their thinking FOR them. And sometimes they even get him to do their crimes, not always voluntarily. So when what should be a straightforward burglary turns deadly dangerous, it isn’t too long before Junior finds himself at the mercy, and in front of the guns (and baseball bats) of some highly suspicious characters. 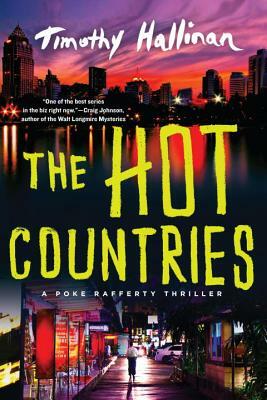 Some time ago, Bangkok-based travel writer Poke Rafferty had the misfortune of encountering a truly evil and terrifying man. This Fear Artist really put Poke through the wringer, trying to get something from him, and almost succeeded in turning his adopted city against him to get it. Poke walked away from the ensuing conflagration a sadder, if not wiser man. Also a richer man, thanks to the Fear Artist’s considerable coffers, though he’s found that money brings its own unique problems. He’s come to care for that man’s badly-damaged daughter, Treasure, as well, which brings a new set of challenges all its’ own.